Everyone has those nights where their phone starts buzzing at 2am because they’re getting messages from friend’s who don’t sleep. It can be a bit annoying and what if you just want to unplug for a while and not receive any messages from friends or family. Sometimes it’s best to turn off the distractions and sign out of Kik on your iPhone or Android. In this guide, I’ll walk you through how to logout of Kik on any device in 2015. Unfortunately, the makers of Kik have made it rather difficult to logout and therefore there are a few options but you’ll want to make sure you look through each of them carefully to choose the right option for you. It depends on how much you use the app and how many ongoing conversations you currently have. The tricks below will teach you how to log out of Kik but you will want to make sure you have a backup of all of your Kik messages first so that you’re not left wondering where your conversation left off and remember if you told your friend something or not. As of now, Kik doesn’t allow any way to bulk save messages from your previous chats. The app will save the messages on their own but if you go to logout you will loose all the messages. For iPhone: If your conversation is within the past 48 hours you can see the most recent 1000 messages in total. If they’re older than 48 hours, you will see the latest 500 messages instead of 1000. For Android: If your chat is within 48 hours you can see the most recent 600 messages. If it’s older than the 48 hours you will only see the last 200 messages. I have no idea why it’s less on Android than iPhone. Take screenshots of messages that are important so you can refer to them another time. Copy and paste individual messages by tapping on the message and tapping on the copy button. Kik does not save any messages on their server so once they’re off of your phone you won’t be able to retrieve them at all. Also, the only way to download all of your messages is to jailbreak your iPhone, which I do not recommend as it opens you up to a lot more liability and viruses. Now that you’ve saved those vital texts that you may want to refer to later, you can jump into your options to logout of Kik Messenger. There are some days where you just feel fed up and need a break from constant messages, phone beeps, and buzzing. If you’ve just about had enough of Kik and want to logout for a bit, I’ll walk you through your options. Keep in mind that you will need to know your password to login again once you sign out. Keep in mind, if you want to logout because you’re being harassed by someone on Kik and want them to leave you alone, you have a few different options. You should report the user immediately using this Kik Reporting Page and block the user from messaging you. You don’t need to logout if you just want one person to stop messaging you. Head over to the Kik Messenger app and tap on Settings, then Your Account, then Reset Kik. This will reset the app as it was when you first downloaded it from the App Store. The other option is to delete the app by holding your finger on the app until a little x appears at the top left corner and then tapping on the x. If you’re on an Android device, head over to your app manager and remove the Kik app completely. This will also have the same effect as signing out. TIP: Make sure you read all of your messages before signing out. Don’t leave anything unread because you won’t be able to read it afterward. TIP 2: You may want to tell friends that message you regularly that you won’t be in touch on the app anymore. You could give them your phone number so they could text you, add them on Snapchat, Facebook, Twitter, etc. That way you can continue some conversations if you want to and stop other conversations. Once you logout of Kik you won’t obviously receive any messages and the app will basically be useless until you login again. Say, you changed your mind or you’ve had enough time away from Kik and you want to sign in again. You will want to make sure you have your username and password and that you’ve already downloaded the app so that you can use it. Just sign in to Kik like you would normally and you will notice that all of your chat history is cleared. However, you will find all of your contacts are still on your contacts list so you won’t have to go back and add all of your friends all over again. ***Also, you’ll notice that all of the messages you missed while you’ve been logged out will come in. Of course, old ones that were already delivered before you logout won’t show up again but messages sent after you sign out will be delivered once you sign in again. Below, we’ll answer some of the most common questions we’ve gotten from readers. Feel free to leave another question below in the comments section if you’re question is not answered below. We’re happy to help as best as we can! Often times if you want to logout it may be because you no longer have your phone or can’t find it and you don’t want random people reading your messages and replying to them. All you will need is to borrow someone’s smartphone. Ideally borrow someone’s smartphone that doesn’t already have Kik Messenger because if you need to login then it will delete all the previous messages. If they don’t have a Kik account already then you won’t have to worry about loosing their messages. Then, simply sign in to Kik on their app and this will force any other device that has your Kik account on it to logout and delete all previous messages. This is a good way to cover yourself if you happen to loose your phone and don’t want anyone to have access to your conversations. Can I Login To Kik On Multiple Devices? It seems a bit counter intuitive but Kik doesn’t allow you to be logged in on multiple devices. As soon as you login to Kik on a new device, it forces any other device to logout of your account. They say this is because they want to protect your privacy but plenty of other platforms allow you to be logged in on multiple devices and don’t have any issues with privacy. On the flip side, if Kik allowed multiple devices to be logged in, then they would just have that many more options for people to use their service. Imagine if you could be logged in on your work computer, iPhone, iPad, and your personal home laptop. You could carry on conversations throughout the day no matter what device you’re currently using. This is a huge advantage to other messaging services like iMessage where it is synced throughout all of your devices and you can login to as many devices as you want. Come on Kik, make this a feature! What Kik Symbols Will Show If I Get Messages While Logged Out? Lastly, we’ll tackle some logistics when it comes to receiving messages while you’re logged out of the app. Say for instance, someone doesn’t know you’ve taken a break from the app and just wants to see what you’re up to and they send you a text. Of course, you’re not going to see it because you’ve logged out of the app. However, what will they see, will they be notified that you never saw the text? 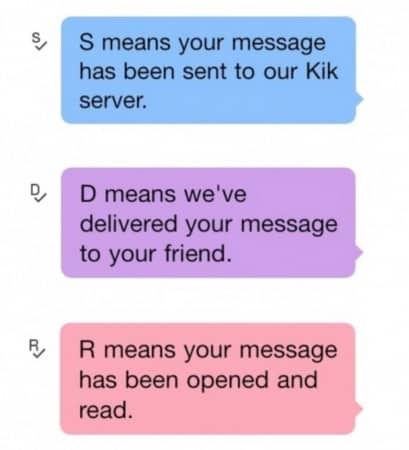 When the person sends you a message it will go from S for Sent to D for Delivered but never go from a light D to a dark D. So basically, you’ll see a permanent light “D” until you login to Kik again and then open the app. At that point, the symbol will turn to a dark “D” and finally to an R once you’ve read the message. Basically, it will look as if you’ve never opened up the app since they sent you the message, which you could still open the Kik app but if you’re not logged in it won’t register that it was fully delivered to your account and you’ve opened the app. That wraps up this guide and hopefully gave you a good sense for your options if you want to logout of Kik Messenger and put a stop to the constant messages. Let us know if you have any other tips or tricks below in the comments so we can try them out. Hopefully Kik will integrate a bit better in the future with multiple devices and leaving a lot more functionality when it comes to when and where you want to use the app. If you enjoyed this article, please feel free to share it on Facebook, Twitter, and of course on your Kik messages to all of your friends!